FIR filed against Mukhtar Abbas Naqvi for calling Azam Khan Mogambo: The FIR was filed based on the statement of district magistrate M K Gupta who was present and monitoring the rally in Rampur on April 15, 2019. 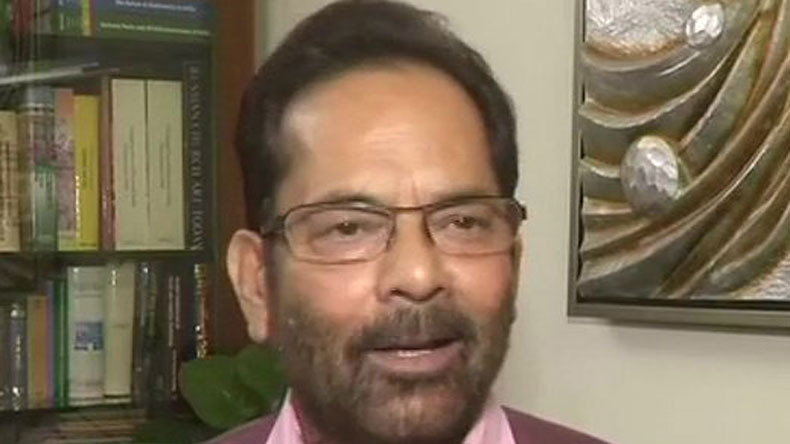 File photo of Mukhtar Abbas Naqvi. FIR filed against Mukhtar Abbas Naqvi for calling Azam Khan Mogambo: A police complaint has been filed against Bharatiya Janata Party (BJP) leader and Union Minister Mukhtar Abbas Naqvi for allegedly violating the model code of conduct after he referred to Samajwadi Party leader Azam Khan as Mogambo. The FIR was filed based on the statement of district magistrate M K Gupta who was present and monitoring the rally in Rampur on April 15, 2019. Reports said Naqvi used the name of popular Bollywood villain “Mogambo” while referring to the SP leader during a public rally at Shahbaad Ram Leela ground in Uttar Pradesh’s Rampur on Monday. Meanwhile, Arun Kumar, Additional Superintendent of Police, has said that the statement made by Union Minister Mukhtar Abbas Naqvi was monitored by the concerned magistrate. The police have registered the case after the magistrate ordered for the same. SP leader Azam Khan had made an objectionable remark on BJP leader Jaya Prada on Sunday. He had said that it took him 17 years to know the actual face of actor Jaya Prada but it took just 17 days to know which colour of underwear she wears. The remarks evoked a lot of anger among BJP and women rights groups. The National Commission of Women had also issued a notice to Azam Khan, BJP leader Jaya Prada had also said that Azam Khan’s candidature should be withdrawn. Union Minister Nirmala Sitharaman had said that this kind of language should be banned and strict action should be taken against Azam Khan for his sexist remark. Later, the police registered an FIR against him and the Election Commission had banned him for 72 hours from campaigning. Azam Khan is contesting on SP ticket against Jaya Prada from Uttar Pradesh’s Rampur. Election Commission has banned several leaders including UP CM Yogi Adityanath, Union Minister Maneka Gandhi, BSP supremo Mayawati from campaigning for the ongoing Lok Sabha elections 2019. And he is still free and liable for election?